Experience a 360 million year journey from Palaeo to Petroleum and enjoy our programs and events with friends and family. These alone are enough to hold attention for hours, from the dinosaur skeletons to the recreated bonebed to the real palaeontologists working in the lab to ‘a walk through time.’ Each visit will reveal something new to discover, especially as exhibits change! Did you know that the oil and gas richs in the region go back millions of years? Learn how events led to the abundance of natural resources here today. Perfect for an easy meal when hunger pains interrupt your museum experience or even for a specific evening trip. 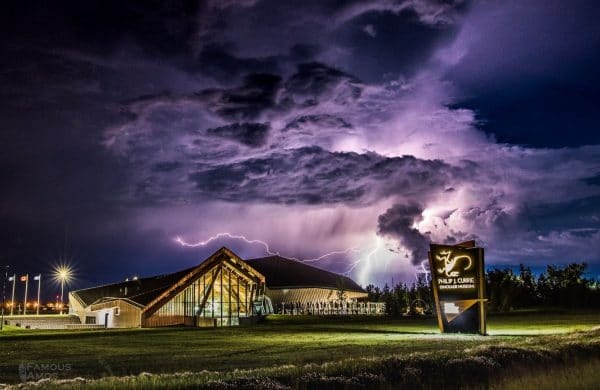 Eating at a dinosaur museum certainly makes for an exceptional night out. Watch dinosaur movies, documentaries, short films and more in the museum’s theatre. Canada’s first National Georgraphic theater. Rent it out for film screenings or movie nights and enjoy your own party in a beautiful museum. Find unique treasures, good books, intriguing doodads and all kinds of dinosaur gear in the gift shop. Whether searching for a great gift or something fun for yourself – or just browsing – the gift shop will be a lot of fun for everyone. Explore the landscaped grounds and find some of our geological curiosities! Play for hours in our dinosaur themed playground! Pack a picnic and sit in the sun with snacks, absorbing everything you saw and learned inside the building. The level of technology combined with fast-paced and fun educational programs will have both adults and youth alike riveted as they learn about palaeontology, geology and natural resources. Bonebed Tours at Pipestone Creek Park!